Is this the end of New York City’s landmarks approval process as we know it? One downtown preservation group claims that New York has reached the "end of the landmarks approval process" with one crucial decision this week. 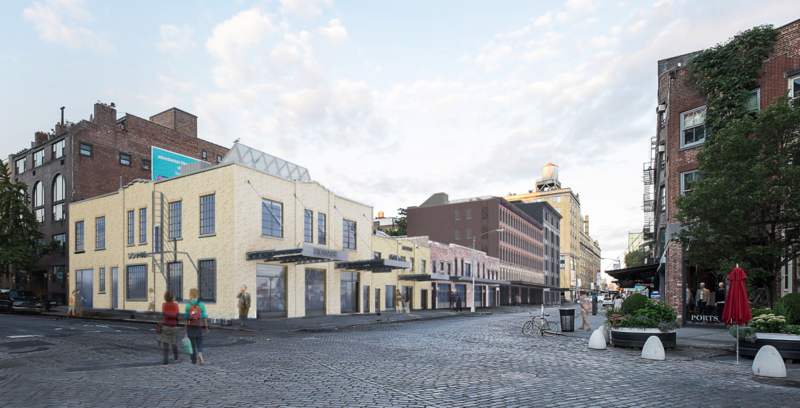 At Tuesday's Landmarks Preservation Commission (LPC), the commission voted 8–2 to approve a building plan on Gansevoort Street between Greenwich and Washington streets. Some neighborhood activists, though, are not happy about the plan. In a 94-page document submitted to the LPC in advance of Tuesday's public meeting, the developers, William Gottlieb Real Estate and Aurora Capital, presented designs prepared by New York–based BKSK to modify 60-68 Gansevoort and 70-74 Gansevoort, two market buildings that date from the late 19th century (but have been modified substantially over time) and are some of the last vestiges of this type of commercial architecture in New York. 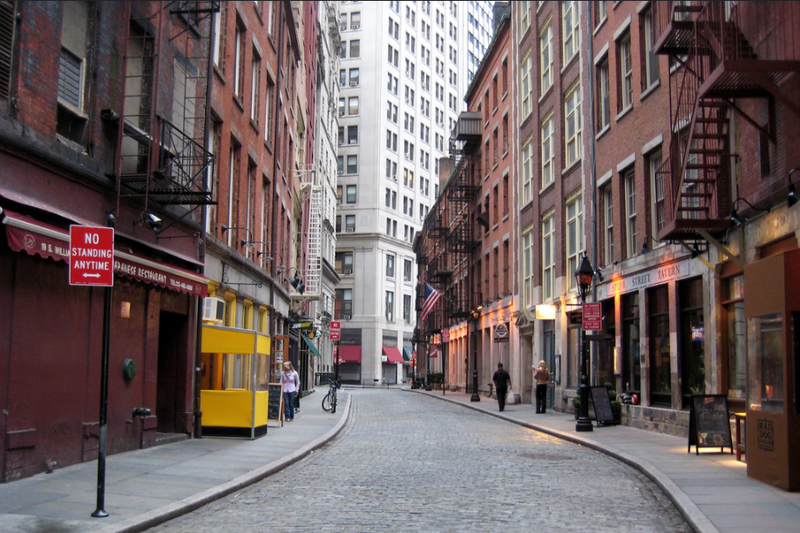 The buildings fall within the Gansevoort Market Historic District, which was established in 2003. Plans call for the restoration and preservation of buildings at 46-48 and 52-58 Gansevoort Street, as well as restoring the existing facade and expanding the second floor at 50 Gansevoort. Three stories will be added to an existing two at 60-68, and 70-74 Gansevoort will host four-story (62 feet) and six story (around 83 feet) buildings, respectively. 70-74 is a "loft-style" building that, the architect's plans suggest, conform to the typology of surrounding lofts and warehouses, but not 46-48 and 50-58. These plans were modified per suggestions from the LPC in February 2016, although the developers disregarded suggestions to lower the height of 60-68 and 70-74 to conform fully with their more diminutive neighbors. The advocacy organization Save Gansevoort believes that the LPC's green light spites the historic district, whose historic value rests on the row of intact market buildings. In a statement, Save Gansevoort noted that the group is “deeply disappointed in the Landmark Preservation Commission's decision today to accept this massive building plan, disregarding the Gansevoort Market Historic District's designation report and more than 75 years of history. The Commission's ruling will not only destroy the last intact block of one-and two-story, market-style structures in Manhattan, but it is also the latest sign that unrestricted development is killing the unique character of so many of our city's most beautiful neighborhoods. In this day and age, it is disconcerting that even our landmarked areas are no longer protected." The Greenwich Village Society for Historic Preservation (GVSHP) decried the lack of opportunity for public testimony at Tuesday's meeting in an email to supporters. In a letter to LPC commissioner Meenakshi Srinivasan submitted in advance of the hearing, Andrew Berman, executive director of GVSHP, noted that the row of buildings, even with alterations in 1916, were 50 to 55 feet in height, including cornices. Although the developers backed away from new construction that included a 120-foot-tall building at 70-74, the group claims that plans for 70-74, and approved plans for a 62-foot-tall 60-68 Gansevoort Street, don't mesh with historic neighboring buildings, whose heights averaged 56.5 feet. 70-74 is modeled on a "warehouse," not "loft," with an attendant height difference: 70-74 will be taller than any loft in the neighborhood and 25 to 40 feet taller than the average building in the historic district, said GVSHP. Overall, preservationists believe this week has not been kind to the historic built environment. The day after the Gansevoort decision, the city council adopted Intro 775A, 38–10. The controversial bill was designed to expedite the LPC's landmarks approval process by imposing deadlines on consideration of items. If a property is not voted on within one year (or a district in two), it is removed from consideration. While the law provides more flexibility within one and two-year deadlines for designation, and a possible one-year extension for individual landmarks under consideration, it removes the 5-year moratorium on landmarks and districts that were nominated but not voted on by the LPC. Among other concerns, groups like GVSHP fear that Intro 775A will encourage developers to try to "run out the clock" so properties are not landmarked. In an email to supporters, the Historic Districts Council called Intro 775A "unnecessary," noting that "[no] one likes a backlog but internal LPC rules would have been the preferred route towards a more accountable designation process." There are potential loopholes, however. The LPC thinks it can de-calendar and de-calendar an item before the deadline hits, ad infinitum, to avoid the moratorium and give items more time for consideration. 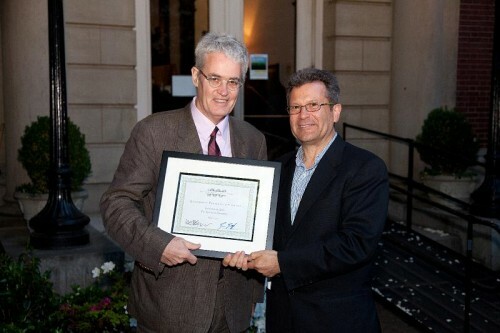 Timed to the 50th anniversary of the New York City Landmarks Law, The New York Landmarks Conservancy, NYU's Furman Center, and Historic Districts Council (HDC) issued independent studies that analyzed the impact of historic preservation on the economy, environment, and housing affordability in New York City. The idea that historic districts drive up housing prices—and drive out poorer residents—is baked into conventional narratives of urban development. This month, the HDC, one of the city's oldest grassroots preservation advocacy organizations, released an analytic report that shows a different side of the story. "The Intersection of Affordable Housing and Historic Districts" uses regression analyses to compare New York City census tracts that overlap with historic districts with census that don't overlap with historic districts. Controlling for borough location and the time a historic district was designated, along with the density of residential units, the study found that, between 1970 and 2010, historic district designation had very little effect on rental prices and the number of rent-burdened families in each district. (There was, however, a correlation in some areas between an increase in average income in some historic districts.) Historic district designation, crucially, didn't prevent the development of government-subsidized housing, nor did designation reduce the number of subsidized units at a rate greater than non-designated areas. A broad survey of the results showed that there may be a negative relationship between rent burden and historic district designation. Significantly, though, a fine-grained regression showed "no statistically significant relationship of rent and income to the concentration (high or low) of residential units in historic district census tracts, or the timing of historic designation." In historic districts, moreover, there was less of a rental housing burden compared to non-historic district census tracts: In historic districts, rental housing burden increased by 8.8 percent, compared to 18.1 percent citywide. In Manhattan and Brooklyn, for the census tracts that didn't overlap with historic districts, the rent burden increase was 9.9 percent (Manhattan) and 20.1 percent (Brooklyn), compared to census tracts that overlap with historic districts (a 4.3 and 10.0 percentage point increase, respectively). The full report can be found here. Tasked with clearing its 95-item backlog, New York City's Landmarks Preservation Commission (LPC) is moving swiftly to shape the future of historic structures in the Big Apple by clearing its docket. On Tuesday, the LPC voted to designate nine items—eight individual structures and one historic district—as New York City Landmarks. Perhaps the most recognizable item on the list was the Pepsi Cola Sign, which has graced the shores of Long Island City, Queens, since 1936. The sign is not a typical landmark. It's an ad for a beverage conglomerate, albeit a charming, retro ad. A debate arose around the nuances of the designation at a meeting in February to present evidence in favor of preservation. Supporters' eyes ping-ponged anxiously as LPC members brought up possible obstacles objections: Would designation cover the metal scaffolding that the bottle and logo are attached to, or would designation encompass just the signs' iconic appendages, leaving a loophole to alter the sign's arrangement? 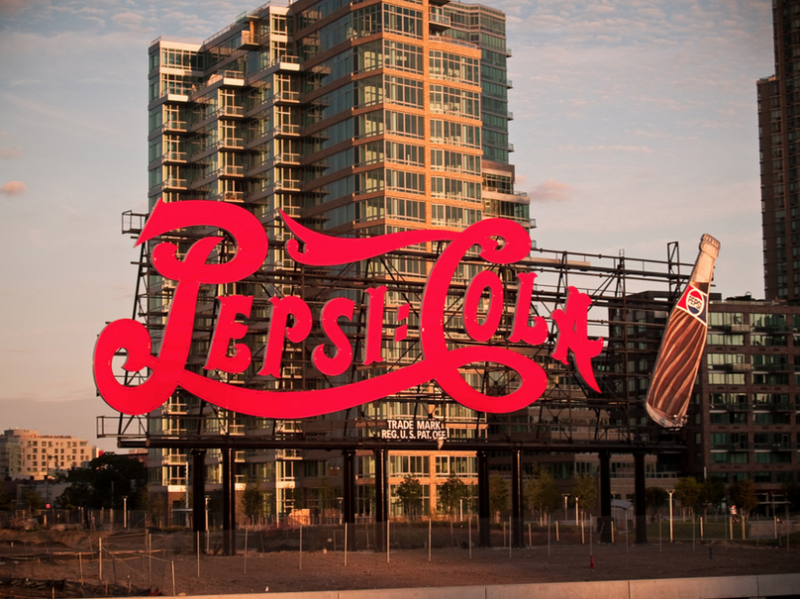 The LPC decided to landmark the Pepsi sign, noting in its recommendation that the sign was preserved once before, as the factory it flanked was sold in 1999. The LPC's decision recognizes the city's manufacturing heritage, and preserves the spirit of place that's otherwise the face of bland waterfront luxury condo development. The grassroots Historic Districts Council (HDC) recommends that the LPC "investigate additional preservation protections, such as an easement or some other form of legal contract to help ensure this landmark’s continued presence." In all, there were ten items recommended for designation, including two whose eclecticism and allure rival the Pepsi sign (the commission delayed a vote on Immaculate Conception Church in the South Bronx.). One residence is a Gravesend landmark: The Lady Moody-Van Sicklen House, a stone, 18th-century Dutch-American-style farmhouse, is a rare survivor from Brooklyn's agrarian past. Local lore holds that the house belonged to Lady Deborah Moody, one of the area's first European women landowners. New Yorkers thrilled by the Neoclassical flourishes of the Fifth Avenue facade of the Metropolitan Museum of Art will be delighted by the LPC's recognition of the Vanderbilt Mausoleum, a diminutive-by-comparison and little-known work by the same architect. École des Beaux Arts–trained Richard Morris Hunt designed the Romanesque Revival final resting place for the titans of industry, located in Staten Island's Frederick Law Olmsted–designed Moravian Cemetery. The Vanderbilts were so impressed by the meeting of minds that they hired Hunt and Olmstead to collaborate on the clan's low-key country house in North Carolina. With that memento mori, the LPC voted to designate a few 19th-century structures within Brooklyn's Green-Wood Cemetery. Although the entire cemetery, a National Historic Landmark, was up for local designation, even ardent preservationists advocated against the designation, noting that landmark status could place onerous restrictions on the 478-acre cemetery's operations: The plots, headstones, and mausoleums are owned by individuals, with 1,200 new "permanent residents" added annually, potentially complicating the regulation process. The largest rural cemetery in the U.S., Green-Wood was designed by David Bates Douglass under the guiding landscape principles of Andrew Jackson Downing. The Gothic Revival entrance on Fifth Avenue, designed by Richard Upjohn and home to a vigorous parakeet colony, was declared an Individual Landmark in 1966. A chapel in the same style by Warren & Wetmore (the same firm behind Grand Central Terminal) received designation this time around, as did the Gatehouse and Gatehouse Cottage at the Fort Hamilton Parkway entrance. For more information and updates on the extension of a Park Slope historic district, St. Augustine’s Church and Rectory, New England on City Island, and other newly-landmarked items, check out the LPC's website.